currently under construction at 437 South Hill Street, Los Angeles. The development is scheduled for completion in 2018. 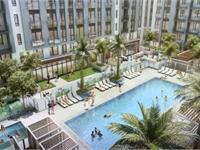 Park Fifth Phase One has a total of 313 units. A seven-story residential building with street-level retail space that serves as the first phase in the development of a parking lot in downtown Los Angeles, which has emerged as a popular residential neighborhood and entertainment hot spot over the 15 years, its population having grown by more than 30% since 2000. 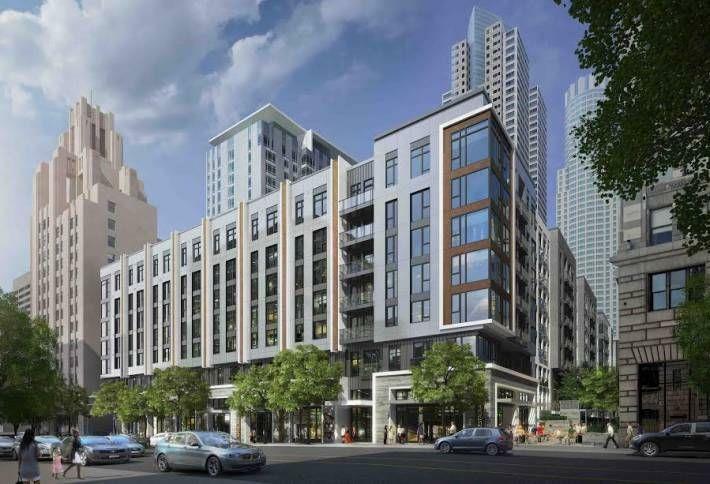 The project’s second phase will consist of a 24-story apartment high-rise with ground-floor retail space that will be built adjacent to the mid-rise. Across West 5th Street from the Pershing Square Metro Station, which provides commuters with underground-rail access to points throughout L.A. 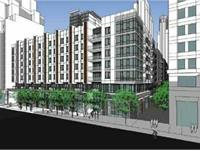 The building also will front the planned route of downtown’s restored historic streetcar line. Amenities will include a 14,000-square-foot outdoor courtyard on an elevated podium deck that will include dining and recreation areas; a pool deck with a zero-edge swimming pool, cabanas, a poolside bar and hot tub; and an indoor/outdoor fitness center with cardio equipment, a weight room and “fitness-on-demand” virtual group-fitness services. Your inquiry will be delivered to the developer / builder of Park Fifth Phase One, who will send you more information about this development.